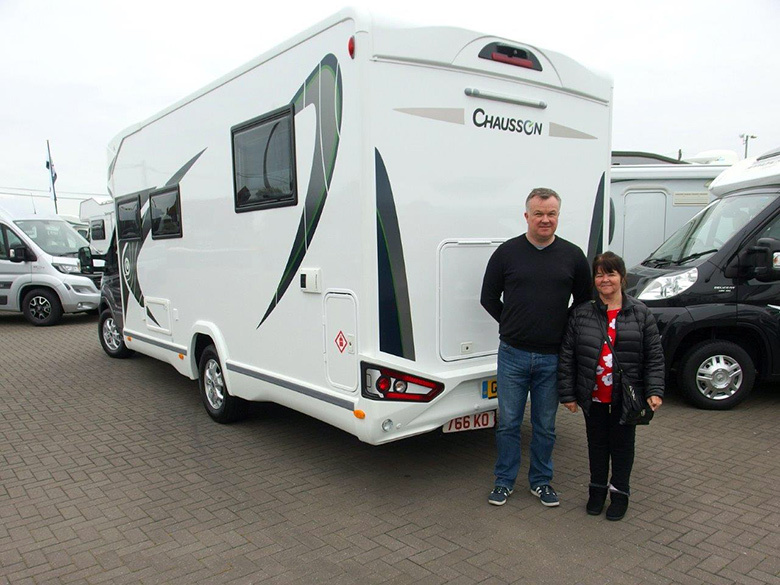 Wayne & Jane are pictured taking delivery of their first new Motorhome. It`s the all new, very impressive 2019 Chausson 768 Welcome Premium, on the equally impressive Ford Transit motorhome chassis. Wayne & Jane are from Bexley-Heath, and chose the 768 Welcome Premium at the Birmingham Motorhome Show last October, as it offered a layout they liked and has a quality that they couldn't find in any other similarly priced motorhomes. It`s a comfortable 4 x berth luxury motorhome, with an excellent specification, including a rear island bed over a large garage beneath, and when they aren't working, they`ll be away in their new Chausson, Exploring all corners of the British Isles before venturing further afield. Shane Catterick and everyone at T C Motorhomes wish them well in their new adventure .